Santa Claus comes to town… in November? The November AUS meeting is coming. We’ll be meeting at 7pm, on Thursday, November 14th at the Memorial United Methodist Church, as usual. Our meeting format, as usual, will begin with some local ukulele news and our usual warm-up song – “Three Little Birds”. Then we’ll play a few songs from our repertoire as well as a holiday song. Here is the song sheet for “Santa Claus is Coming to Town,” the Phil Spector arrangement as performed 40-odd years ago by the Crystals. You can check out the video below and play along (it’s in the same key – the song itself starts at about 0:40). We’ll also spend some time on “Ring of Fire” and try to get a video recorded as well. Feel free to get comfortable with the chord charts for any of the songs in our repertoire, all available here: at our Ukulele Music Library. We’ll follow up our practice with some open mic time for those of you who’d like to showcase a tune you’ve been working on. Then we’ll play a song or two together to close out the meeting. We are excited to have available brand-new black t-shirts with the original logo redesigned in a distressed style, by the lovely Lyda Guz! They are available in a variety of sizes, both in men’s/unisex heavyweight tee and women’s v-neck style. Matt and Jen have modeled the t-shirts, both size small, in the respective styles (see attached). We’ll have them available at the meeting, and these will be just $15 apiece. Early Hanukkah/Christmas shopping, anyone? 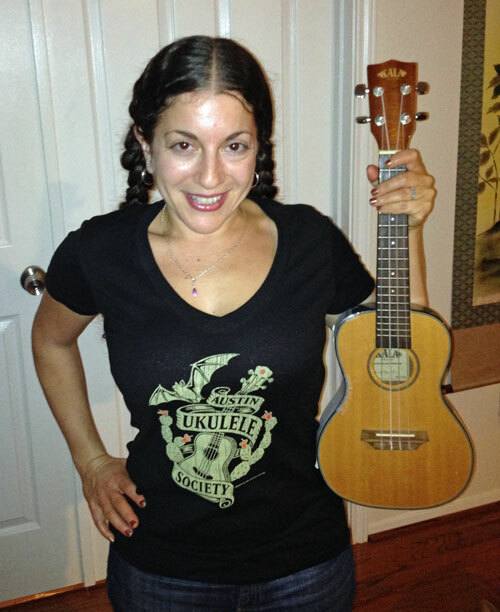 Please bring cash or a check (checks should be made out to Jen Brown – not the Austin Ukulele Society – thanks!). 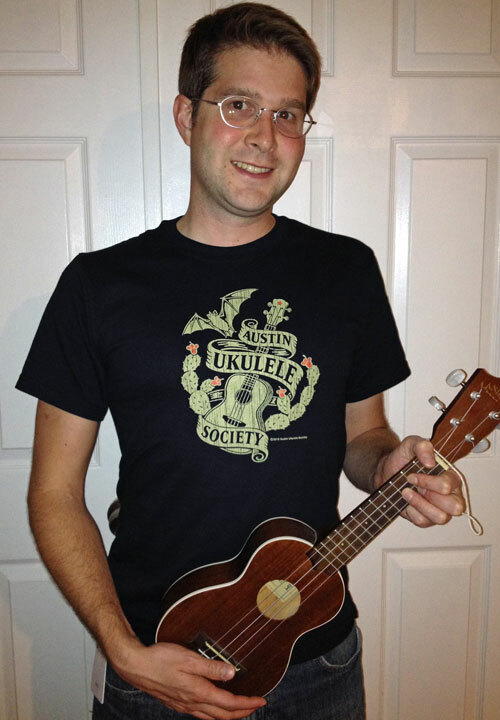 This entry was posted in AUS activities on November 9, 2013 by Austin Ukulele Society.